Screen Shots of the recently released KING Companion App for the King Schools’ Online Drone Pilot License Test Prep Course. 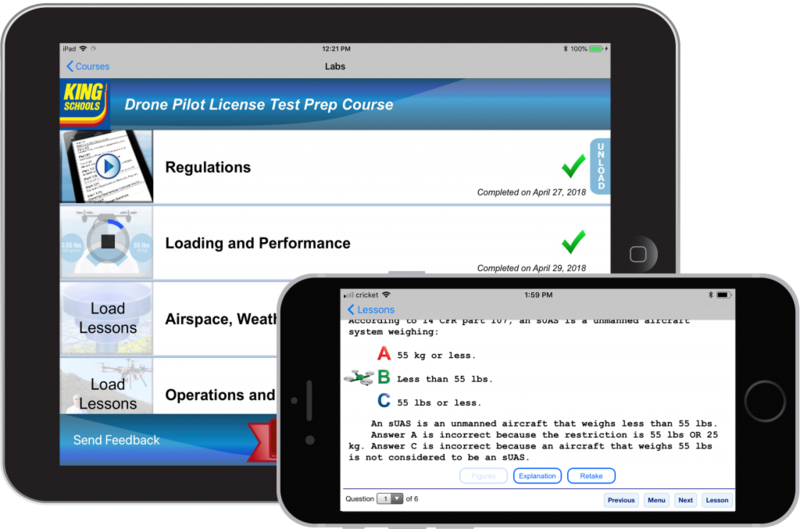 The app enables drone pilots who are preparing for the FAA Part 107 Remote Pilot Knowledge Test to download their lessons, including all text, graphics, videos and post lesson quizzes, and take them when offline. When back online, course progress is automatically synchronized with King’s servers and available from any other device. May 4, 2018 – AUVSI Conference, Denver CO. – Aspiring Drone Pilots now have a convenient way to continue their studies even when they are offline by using the free KING Companion App for iPad or iPhone together with King Schools’ Online Drone Pilot License Test Prep Course. Over the last four decades, pilots at all levels have enjoyed King Schools´ clear, simple and fun video courses. King Schools has helped hundreds of thousands of pilots pass their FAA tests and is the world’s leader in FAA test preparation. It is estimated as much 50% of the pilots flying in the U.S. today have learned with a King course. This entry was posted in King News, King Press Releases on May 4, 2018 by Pilot One.